Colonel John “Jack” Hougen details his illustrious military career. John Hougen at his Edina home and photographed in 1951 at 25 years old. According to his Report of Separation from Active Duty, Colonel John “Jack” Hougen’s military career lasted 33 years. The report also lists his numerous commendations, medals and badges, implying his uniform glittered. What the report didn’t show was his strong leadership of the men he led over many tours of duty and assignments. What it also missed was the amazing front-row seat Hougen, a 38-year Edina resident, had at many important historical events. 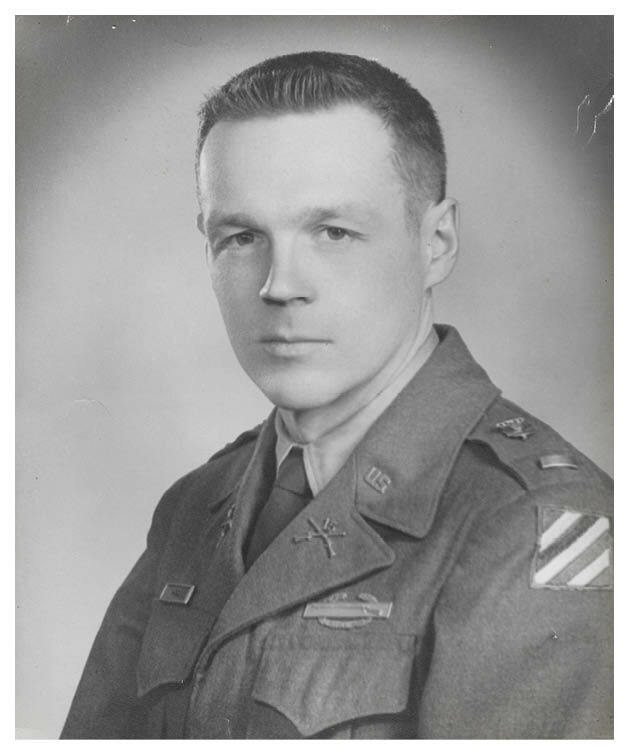 Born in Crookston, Minn., Hougen’s father, a lawyer, served in World War II with the famous 34th infantry division. At 17, Jack Hougen wanted to join up, too, but needed his mother’s permission. She gave it hesitatingly; Hougen joined the U.S. Army Air Corps and was assigned to Europe in December 1943. He remembers, “I had a nine-man patrol and we were in a heavily wooded area in Czechoslovakia. We came to a farmhouse and saw two uniformed men loading a horse-drawn wagon. One of them, when he saw us coming, said in American English, ‘If you are going to shoot me, give me a Lucky Strike first.’ ” Surprisingly, the two had attended the same high school in Minnesota. Hougen would later attend the University of Minnesota but remained in reserve with the National Guard. Then he decided to make the army his career. He applied for active duty in 1948, and in 1950, his group was the first unit from the States to go to North Korea. While on the battlefield there, the men faced surprise attacks by the Chinese. There were many casualties. It was “like human tidal waves that came at us,” he says of the fighting there. “I was assigned a hard-luck division,” Hougen says of the command he had then. He wanted to improve morale and their reputation. “I made the cooks go up to the front lines and make eggs to order for the troops. Things improved. We only lost one guy during that time to desertion.” When Hougen returned home he was assigned as a Pentagon congressional liaison officer in Washington, D.C. In 1965 he went to Vietnam and was stationed in Bien Hoa outside of Saigon. He commanded a battalion of about 836 men. Hougen returned to the United States in 1967, attended the Army War College and studied international relations. Returning to the Pentagon office of the assistant chief of staff for intelligence, he was promoted to colonel in October 1968. He formed a civil disturbance unit to provide security at the 1968 Chicago Democratic Convention, returned to Vietnam in 1971 and was back home in 1972. He would oversee army recruiting, develop training programs and work with colleges and high schools on Project Ahead. After serving selflessly for decades, Hougen retired in 1976 and moved to Edina in 1978. This November, in honor of Veterans Day, we extend a special thanks to Col. Hougen and all of our veterans for their service. Joined the army in 1943 and served in Europe during WWII. Graduated from the U of M in 1948. Served in Korea from 1950-51. Awarded the Silver Star for bravery in Korea. Awarded Legion of Merit four times. Awarded Bronze Star with Valor Device with one oak cluster. Awarded Joint Services Commendation medal.